Limited and exclusive bipedalism can offer a species several advantages. Bipedalism raises the head; this allows a greater field of vision with improved detection of distant dangers or resources, access to deeper water for wading animals and allows the animals to reach higher food sources with their mouths. While upright, non-locomotory limbs become free for other uses, including manipulation (in primates and rodents), flight (in birds), digging (in giant pangolin), combat (in bears, great apes and the large monitor lizard) or camouflage (in certain species of octopus). 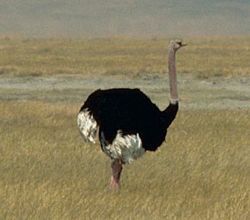 The maximum bipedal speed appears less fast than the maximum speed of quadrupedal movement with a flexible backbone – both the ostrich and the red kangaroo can reach speeds of 70 km/h (43 mph), while the cheetah can exceed 100 km/h (62 mph). Even though bipedalism is slower at first, over long distances, it has allowed humans to outrun most other animals according to the endurance running hypothesis. Bipedality in kangaroo rats has been hypothesized to improve locomotor performance, which could aid in escaping from predators. There are a number of states of movement commonly associated with bipedalism. Standing. Staying still on both legs. In most bipeds this is an active process, requiring constant adjustment of balance. Walking. One foot in front of another, with at least one foot on the ground at any time. Running. One foot in front of another, with periods where both feet are off the ground. Jumping/hopping. Moving by a series of jumps with both feet moving together. The great majority of living terrestrial vertebrates are quadrupeds, with bipedalism exhibited by only a handful of living groups. Humans, gibbons and large birds walk by raising one foot at a time. On the other hand, most macropods, smaller birds, lemurs and bipedal rodents move by hopping on both legs simultaneously. Tree kangaroos are able to walk or hop, most commonly alternating feet when moving arboreally and hopping on both feet simultaneously when on the ground. There are no known living or fossil bipedal amphibians. Many species of lizards become bipedal during high-speed, sprint locomotion, including the world's fastest lizard, the spiny-tailed iguana (genus Ctenosaura). The first known biped is the bolosaurid Eudibamus whose fossils date from 290 million years ago. Its long hindlegs, short forelegs, and distinctive joints all suggest bipedalism. The species became extinct in the early Permian. All birds are bipeds when on the ground, a feature inherited from their dinosaur ancestors. Bipedalism evolved more than once in archosaurs, the group that includes both dinosaurs and crocodilians. All dinosaurs are thought to be descended from a fully bipedal ancestor, perhaps similar to Eoraptor. Bipedal movement also re-evolved in a number of other dinosaur lineages such as the iguanodons. A number of groups of extant mammals have independently evolved bipedalism as their main form of locomotion - for example humans, giant pangolins, the extinct giant ground sloths, numerous species of jumping rodents and macropods. Humans, as their bipedalism has been extensively studied, are documented in the next section. 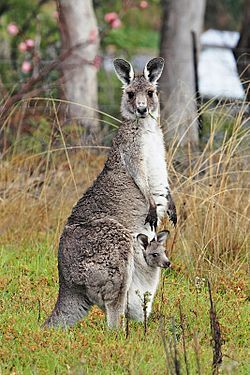 Macropods are believed to have evolved bipedal hopping only once in their evolution, at some time no later than 45 million years ago. Bipedal movement is less common among mammals, most of which are quadrupedal. All primates possess some bipedal ability, though most species primarily use quadrupedal locomotion on land. Primates aside, the macropods (kangaroos, wallabies and their relatives), kangaroo rats and mice, hopping mice and springhare move bipedally by hopping. Very few mammals other than primates commonly move bipedally by an alternating gait rather than hopping. Exceptions are the ground pangolin and in some circumstances the tree kangaroo. One black bear, Pedals, became famous locally and on the internet for having a frequent bipedal gait, although this is attributed to injuries on the bear's front paws. Most bipedal animals move with their backs close to horizontal, using a long tail to balance the weight of their bodies. The primate version of bipedalism is unusual because the back is close to upright (completely upright in humans). Many primates can stand upright on their hind legs without any support. Chimpanzees, bonobos, gibbons and baboons exhibit forms of bipedalism. On the ground sifakas move like all indrids with bipedal sideways hopping movements of the hind legs, holding their forelimbs up for balance. Geladas, although usually quadrupedal, will sometimes move between adjacent feeding patches with a squatting, shuffling bipedal form of locomotion. The evolution of human bipedalism, began in primates about four million years ago, or as early as seven million years ago with Sahelanthropus. One hypothesis for human bipedalism is that it evolved as a result of differentially successful survival from carrying food to share with group members, although there are alternative hypotheses. Injured chimpanzees and bonobos have been capable of sustained bipedalism. Three captive primates, one macaque Natasha and two chimps, Oliver and Poko (chimpanzee), were found to move bipedally. Natasha switched to exclusive bipedalism after an illness, while Poko was discovered in captivity in a tall, narrow cage. Oliver reverted to knuckle-walking after developing arthritis. Non-human primates often use bipedal locomotion when carrying food. Energy-efficient means of standing bipedally involve constant adjustment of balance, and of course these must avoid overcorrection. The difficulties associated with simple standing in upright humans are highlighted by the greatly increased risk of falling present in the elderly, even with minimal reductions in control system effectiveness. Shoulder stability would decrease with the evolution of bipedalism. Shoulder mobility would increase because the need for a stable shoulder is only present in arboreal habitats. Shoulder mobility would support suspensory locomotion behaviors which are present in human bipedalism. The forelimbs are freed from weight bearing capabilities which makes the shoulder a place of evidence for the evolution of bipedalism. Walking is characterized by an "inverted pendulum" movement in which the center of gravity vaults over a stiff leg with each step. Force plates can be used to quantify the whole-body kinetic & potential energy, with walking displaying an out-of-phase relationship indicating exchange between the two. Interestingly, this model applies to all walking organisms regardless of the number of legs, and thus bipedal locomotion does not differ in terms of whole-body kinetics. Running is characterized by a spring-mass movement. Kinetic and potential energy are in phase, and the energy is stored & released from a spring-like limb during foot contact. Again, the whole-body kinetics are similar to animals with more limbs. Bipedalism requires strong leg muscles, particularly in the thighs. Contrast in domesticated poultry the well muscled legs, against the small and bony wings. Likewise in humans, the quadriceps and hamstring muscles of the thigh are both so crucial to bipedal activities that each alone is much larger than the well-developed biceps of the arms. A biped has the ability to breathe while running, without strong coupling to stride cycle. Humans usually take a breath every other stride when their aerobic system is functioning. During a sprint the anaerobic system kicks in and breathing slows until the anaerobic system can no longer sustain a sprint. 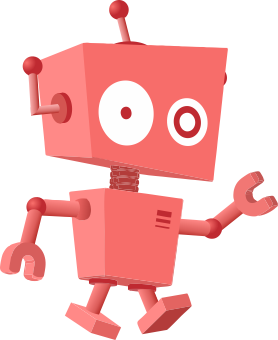 For nearly the whole of the 20th century, bipedal robots were very difficult to construct and robot locomotion involved only wheels, treads, or multiple legs. Recent cheap and compact computing power has made two-legged robots more feasible. 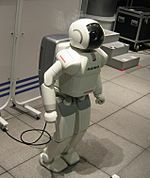 Some notable biped robots are ASIMO, HUBO, MABEL and QRIO. Recently, spurred by the success of creating a fully passive, un-powered bipedal walking robot, those working on such machines have begun using principles gleaned from the study of human and animal locomotion, which often relies on passive mechanisms to minimize power consumption. Bipedalism Facts for Kids. Kiddle Encyclopedia.